Floyd Jones, retired stock broker and philanthropist, with his partner, Alene Moris. 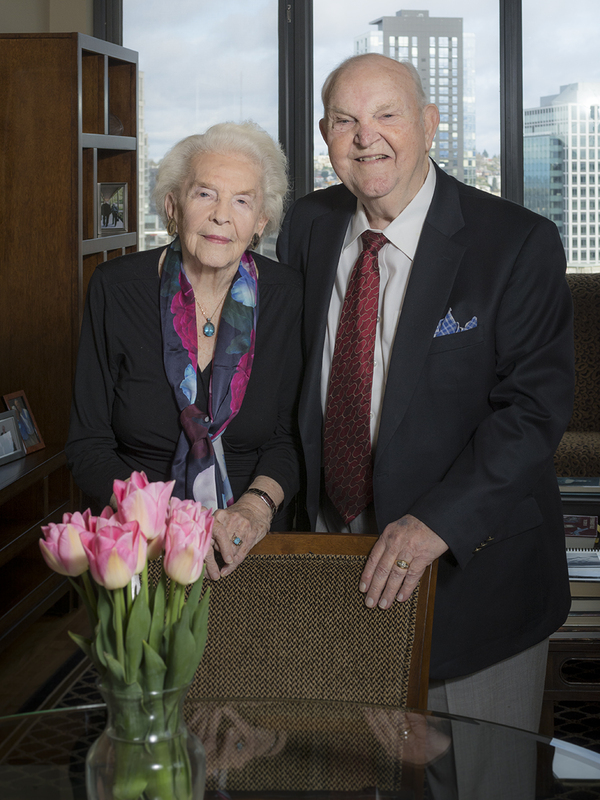 SEATTLE – (April 19, 2017) – Virginia Mason has received a $5 million commitment from philanthropist Floyd Jones to establish the Floyd Jones Learning, Innovation and Simulation Center at Virginia Mason. The center will serve as an education hub and incubator where Virginia Mason team members will collaborate with patients and their families in developing and testing processes to continuously improve quality, safety and the patient experience. The center is scheduled to open on the Virginia Mason campus in 2018. This pledge brings Jones’ total support of Virginia Mason to more than $26 million. Ten years ago, he and his late wife, Delores, donated $20 million for construction of the Floyd and Delores Jones Pavilion at Virginia Mason. The pavilion houses the medical center’s emergency department, critical care unit, inpatient orthopedics and other patient services. Also, the Virginia Mason Cancer Institute is named in honor of Floyd and Delores Jones. The Floyd Jones Learning, Innovation and Simulation Center will enhance the ongoing work in which patients and their families regularly participate with Virginia Mason staff in the organization’s continuous-improvement workshops. These events use tools of the Virginia Mason Production System, the organization’s management methodology, to eliminate waste (anything that does not add value from the patient’s perspective) and to advance quality, safety and efficiency. In addition to Virginia Mason, Jones has donated millions of dollars to a variety of organizations over the years, including the Floyd and Delores Jones Playhouse in Seattle; American Civil Liberties Union; Seattle’s Union Gospel Mission; and the Stanwood-Camano YMCA. He and his partner, Alene Moris, are committed to equality, justice and basic human rights and they strive to improve their community in significant ways.